Peter Gildernew, a seventeen-year old performing arts student from just outside Dungannon, is no stranger to the show and is delighted to be bringing the lovable, if slightly daft, character of Scarecrow to life. “My first ever musical was The Wizard of Oz when I was in primary school,” he told us. “When I was in secondary school I used to dream about being on the stage of the Grand Opera House. The cast have a very tight rehearsal schedule for the show, which opens on Thursday July 26 and runs until Sunday July 29. However, Peter admits that he loves the thrill of rehearsals and he is already looking forward to the curtain going up on opening night. “It is only two weeks of rehearsals but I really love it,” Peter continued. 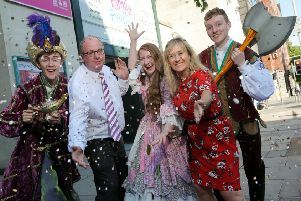 This is the first time that Holly, a student at Belfast High School, will take on a lead role, although she has been involved with the summer project in previous years. Admitting to having a few nerves about opening night, Holly is delighted to be playing the role of Dorothy. “This is the first time I have got a principal role and it is always something I wanted,” she said. “There is a lot of talent on stage and so much competition so I wasn’t really expecting it, and when I found out I was so excited to tell everyone and see their reaction. 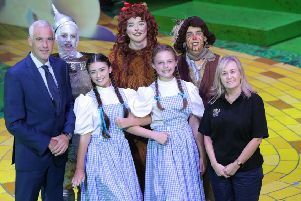 Tickets for The Wizard of Oz, which runs from Thursday July 26 - Sunday July 29, are on sale now from the Grand Opera House Box Office and online at www.goh.co.uk.